Wondering how to make something exciting with the Christmas pudding? 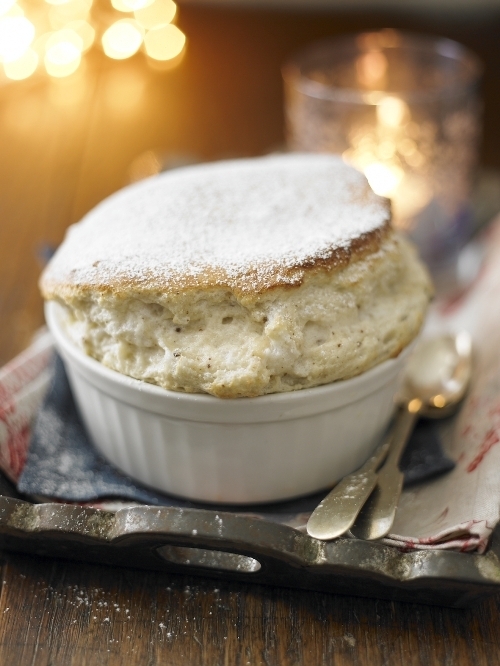 Despite its myriad of rich flavours – Christmas pudding, ginger, cherries and brandy – this soufflé manages to taste decadent yet light. Preheat oven to 180°c (fan oven 160°c), gas mark 4. Butter an 18cm (7 inch), 1.7 litre (3 pint) soufflé dish. Put a flat baking sheet in the oven to heat up. Melt the butter in a saucepan, stir in the flour and gradually add the milk. Bring to the boil, stirring, then reduce the heat and cook for 2 minutes. Stir in 50 g (2 oz) of the sugar with the ginger, then beat in the egg yolks. Gently fold in the Christmas pudding mixture into the sauce. Whisk the egg whites until they form soft peaks, then gradually whisk in the remaining sugar until the meringue is stiff and glossy. With a large melt spoon fold the meringue into the sauce and turn into the prepared dish. Sit the dish on the heated baking sheet and bake for 45 minutes until well risen and golden. Dust with icing sugar and serve straight away. The sauce for the soufflé can be made the day before it is needed. Don’t beat in the 50 g caster sugar but sprinkle on top of the sauce to prevent a skin forming. When ready to cook, beat well before whisking and fold in the meringue as above.